Abc de la Brodeuse [D6250] - $10.00 : Yarn Tree, Your wholesale source for cross stitch supplies. 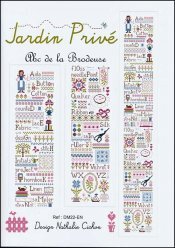 Cross stitch pattern by Jardin Prive. This pattern features words used for needlework such as, "Aida," "Linen," "Needlepoint," etc. Throughout this pattern is also a needle with thread, a woman holding a needle and thread, scissors, buttons, a pattern, etc. Stitch count 76w x 565h.